Experience an unmissable Australia destination with campervan hire in Perth. The capital of Western Australia on the Indian Ocean is a gem of a city. Hiring a camper van allows you to see Perth like no other way can. This is a richly diverse area, full of outdoor activities, cultural sights and fun on the water. With motorhome hire you can take in everything Perth has to offer. Relax and enjoy this incredible area at your leisure – once you are here, you won’t want to leave! One of the biggest draws of Perth is its wealth of natural beauty. The advantage of a campervan hire holiday is that you don’t just see it – you’ll wake up in the morning with spectacular scenery and wildlife all around you. It’s all on Perth’s doorstep. To the north, Kimberley is Western Australia’s main outback destination, where you can discover Aboriginal culture in this stunning landscape of cliff-lined coast, rugged mountains and gorges. Then there are the national parks which are easily assessable from Perth by campervan: at the Walpole Nornalip National Park you can take a tree top walk far above the forest in the imposing Valley of the Giants, or you can visit the 350 million year old massif at Purnululu National Park. With campervan hire, a holiday in Perth gives you complete flexibility to visit everything you want to see, and discover the area at your own pace. Having your own campervan transport and accommodation means you can easily see all the sides of life Perth has to offer. 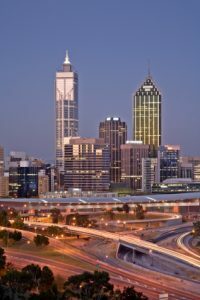 Perth itself is full of things to see and do: there are the parks and gardens, including Kings Park and Caversham Wildlife Park, where you can see koalas and wombats, as well as beautiful beaches, and great shopping and food. Perth has some world-class culture and architecture including Burswood Entertainment Complex and Swan Bells. It’s also famous for its Aussie rules football – quite an experience if you can get to see a game! Hiring a campervan means you can easily get out to some of the wonderful sights offered by the surrounding area of Perth. There’s Rottnest Island, and one of the biggest highlights is driving to the coast for whale watching. Motorhome hire allows you to get away from the tourist trail and reach some unique spots along the area’s unspoilt coastline. There are some of Australia’s best divine locations at Exmouth and the Abrolhos Islands, and you can feed dolphins at Mia Monkey beach. A drive through this amazing scenery is just one of the highlights of a camper van holiday in Perth. A vw camper van hire holiday also gives you the option to leave your camper behind for a day and spend time enjoying some of the outdoor activities Perth has to offer: surfing, sailing or scuba diving. When you get back to your camper van, you can enjoy the comfort of your own bed in spectacular surroundings. Whether you are taking a family holiday or a trip with friends, a campervan holiday in Perth will be a holiday to remember.